A clear sky. Low 39F. Winds WSW at 10 to 20 mph..
A clear sky. Low 39F. Winds WSW at 10 to 20 mph. Adrinne Vetter speaks during the tour of Social Justice Alley in downtown Laramie Friday, Sept. 28, 2018. The "Ring of Peace" art installation by sculptor Chris Navarro, located outside First United Methodist Church in downtown Casper, was dedicated in part to Matthew Shepard. Elton John waves to the crowd in March 2017 during his show at the Casper Events Center. John has helped raise upward of $1 million for the Matthew Shepard Foundation. Grammy-winning choral group Conspirare performs "Considering Matthew Shepard." Laramie High School teacher Nicki Bondurant speaks Sept. 28 during a discussion of Adrienne Vetter’s “Wild West Social Justice” mural in Laramie. Bondurant is one of the three “Angel Action” counterprotesters pictured in the mural. The counterprotesters dressed as angels with giant wings to block out the Westboro Baptist Church when it protested the 1999 trial for the murder of Matthew Shepard, an gay University of Wyoming student and Casper native. In November 1998, a theater group from New York arrived in Laramie, a town reeling after a brutal murder. The Tectonic Theater Project eventually would create “The Laramie Project,” which examined how Wyoming reacted to the killing of Matthew Shepard. The play would go on to be performed at schools and theaters around the world. But the group had no plans of writing a play when they visited Wyoming to talk with community members after Shepard’s death, said Leigh Fondakowski, head writer of “The Laramie Project.” The gay 21-year-old University of Wyoming student died Oct. 12, 1998, after two men beat him and left him tied to a fence outside Laramie. The murder caught the attention of people around the world. The company visited the town through the year after Shepard’s death and wrote “The Laramie Project” from more than 200 interviews. They thought they’d perform it and that would be the end of it. Instead, the play continues to be performed around the country. “The Laramie Project” is arguably the most recognizable work inspired by Shepard’s death. But it’s only one of many. Shepard’s death has sparked two decades of art — from music to plays and poetry to film. “Art ... goes way beyond ideology and goes into what is real, and what is transcendent and what is beautiful and what is meaningful and what is resonant as human beings,” Fondakowski said. Artists have used theater, paintings, sculpture, film, books, poetry, music and even teddy bears to examine Shepard’s story. Another work exploring the community response is the film “Laramie Inside Out,” by Beverly Seckinger, which she created shortly after the murder in her hometown. As an out professor from Laramie who supports and mentors LGBTQ students at the University of Arizona, she felt she had a role to play. There was also a “ride to the rescue” feeling, she said, to defend her oft-vilified community and university and explore the heart of Laramie herself. “I had to go see for myself,” as she says in the film. She and Shepard had become friends in theater at the Swiss boarding school they attended while his parents lived in Saudi Arabia. She was devastated by his death and rarely talked about him until she started working on the film more than a decade later. Another work that focuses on Shepard as a person is “Considering Matthew Shepard,” a concert-length, three-part fusion oratorio that Craig Hella Johnson wrote for his Grammy-winning choral group, Conspirare. The piece incorporates works of poetry and Shepard’s journals, which audiences can read in his own handwriting on a screen above. The group performed the 2016 composition as part of the Matthew Shepard Memorial Group’s 20th anniversary events at the University of Wyoming. Shepard’s story has inspired several films, including the TV movie “The Matthew Shepard Story,” which garnered an Emmy for Stockard Channing’s performance as Judy Shepard. A vast number of songs have been written about or dedicated to Shepard, including Elton John’s “American Triangle,” Melissa Etheridge’s “Scarecrow,” Cyndi Lauper’s “Above the Clouds” and “Jesus is on the Wire” written by Thea Hopkins and recorded by Peter, Paul and Mary. Among the earliest was Randi Driscoll‘s “What Matters,” which she penned just days after seeing a photo of Shepard’s parents at his funeral. Driscoll decided to give the Matthew Shepard Foundation 100 percent of the song’s proceeds and later wrote a sequel amid the debate for marriage equality in California. She isn’t surprised so many works of art have been inspired by Shepard’s death. “I think that people have tapped into this story of wanting there to be a better tomorrow,” she said. “The Laramie Project” remains the most well-known piece of art created in light of Shepard’s murder. It has spanned beyond the Tectonic productions to performances by Hollywood stars and students around the world. “The Laramie Project” HBO TV movie starred Peter Fonda, Christina Ricci and Steve Buscemi. Participants at last month’s “Laramie: A Legacy” benefit reading in New York included Anderson Cooper, Samira Wiley, Mary Louise Parker, Asia Kate Dillon and Olympic skater Adam Rippon. The Matthew Shepard Foundation has worked with Tectonic to create educational and discussion materials and organize talks with performing groups and audiences. One such group was Natrona County High School. “The Laramie Project” is the most difficult play Natrona County High School teacher Zach Schneider has ever been part of, he said. He and Shepard grew up together. His involvement with “The Laramie Project” goes back to the beginning, when he wrote about the play’s 2000 premiere in Denver for the Star-Tribune. In 2006, he performed in Casper’s first production of the play at Stage III Community Theater, where Shepard also had acted in plays. Schneider directed “The Laramie Project at Natrona County High while completing his master’s thesis about the play. When Stage III produced the play, many season ticket holders skipped that show or didn’t renew, he said. Some believed the play made Wyoming look bad, but Schneider calls it a love letter to Laramie. Schneider credits the response to Shepard’s murder and the TV show “Will & Grace” as two reasons that progress for the LGBTQ community has come so far. Shepard’s death has a lasting effect on Elton John, one of the most famous gay musicians in history. At a recent concert in Casper, John mentioned that he had received a copy of the Star-Tribune opinion page in which Marsden, then a Star-Tribune reporter, wrote a column in Shepard’s honor. John sent a signed copy of the page to Shepard’s parents with the words, “This must never happen again.” John has said he has a photo of Shepard in his kitchen to which he says hello each morning. He befriended the family and championed their foundation, for which he performed several benefit concerts. The more than $1 million he’s contributed were vital to the foundation becoming financially stable and expanding to a national level, Marsden said. Josue, the “Matt Shepard is a Friend of Mine” director, said she’s always struck by the artistic response to her friend’s story. That change, she said, through empathy. “I think the artist does that not by creating necessarily political theater, or didactic theater — theater that takes sides or that makes a political statement — but theater that moves people to think about their lives differently and recognize our common experience as humans, our commonalities as opposed to our differences,” she said. Lesléa Newman arrived in Laramie the day Shepard died. Shepard had been part of the planning committee that brought her there as keynote speaker for UW’s Gay Awareness Week. Her book “October Mourning: A Song For Matthew Shepard” collects 68 poems she began writing after watching a performance of “The Laramie Project: 10 Years Later” in 2009. Eight of the poems are included in “Considering Matthew Shepard.” Composer Curtis Heard set the entire book to an opera. Few physical memorials to Shepard exist because of fear of possible vandalism, said Marsden, the Matthew Shepard Foundation’s executive director. The few that do exist in Wyoming do not depict Shepard himself. There’s nothing more the family can do for Shepard himself, Marsden said, so the foundation hopes that memorials focus on preventing a similar tragedy. 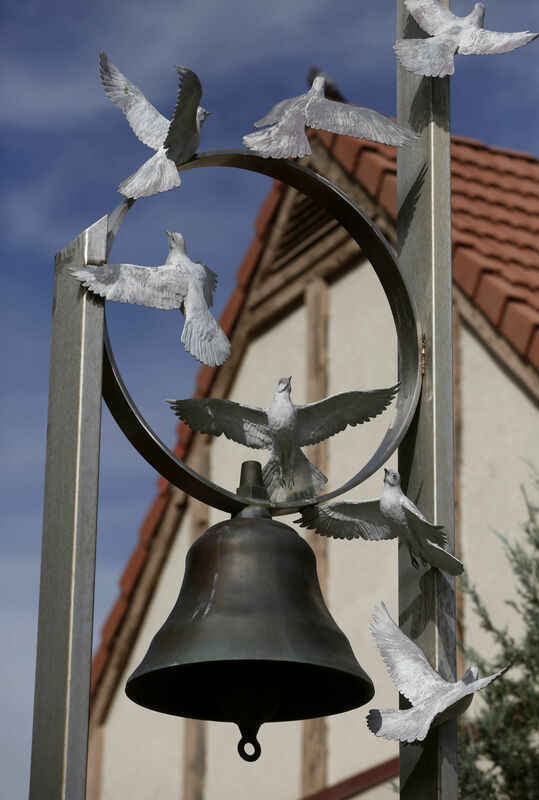 Casper sculptor Chris Navarro’s “Ring of Peace,“ which depicts a bell surrounded by doves, was installed in 1999 on Second Street in downtown Casper. The piece is dedicated to Shepard, the victims of Columbine and all other victims of violence, Marsden said. Navarro creates miniature replicas with functioning bells for the foundation’s yearly gala. A new mural in downtown Laramie, “Wild West Social Justice” by Laramie artist Adrienne Vetter includes three of the “Angel Action” activists among other figures from Wyoming’s civil rights history including the Black 14 and suffragettes. The activists wore homemade wings to obscure protesters from the Westboro Baptist Church during the trial of one of Shepard’s murderers. The tactic has since been used after other tragedies, such as the Pulse nightclub shootings. Black and white figures related to Wyoming’s social justice and civil rights history are painted in juxtaposition with sepia-toned figures from the Wild West era. The portraits look the viewers straight in the eye, an intentional artistic decision. “I still think that some of these moments of history are moments that we haven’t fully confronted or faced,” Vetter said. “... The murder of Matthew Shepard is still an event that I think that we as Wyomingites and anybody who lives in Laramie still grapple with. It’s been made part of our identity in a really broad way.